Click on the picture for Interactive First Picture French, or scroll down and click on the topic links to hear the words by themselves. For the interactive version you need the free Adobe Flash Player. 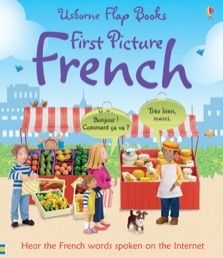 Delightful scenes with speech bubbles and natural dialogue introduce young children to the French language in a natural way. With flaps to lift to reveal the English translation of the simple French phrases. Key vocabulary is highlighted in a separate panel to help children learn essential words. Features scenes such as the classroom, the park and the farm illustrated with Jo Litchfield’s colourful models. With Internet-links to interactive scenes and online pronunciation guide. An involving and accessible way to introduce children to conversational French. There is no pronunciation guide but readers can visit the Usborne website to hear the words spoken.